Insects are pollinators, which means they help the spread of seeds to ensure the survival of plant life. That role makes the sudden decline of insects in our ecosystem significant. In honor of Earth Day, check out these recent articles to find out what's been hypothesized and confirmed about this decline. You can read these articles using CPL's Online Resources. Despite the benefit of increased crop production that pesticides allow, one hazardous effect is the diminishing honeybee population. Ironically, more than half the world's crops rely on bees for pollination. The importance of building strategically mindful policies is stressed by noting the decline and importance of other wild pollinators apart from honeybees. One of the most magical bugs is disappearing. Light pollution and habitat loss may be culprits. Learn the science behind fireflies' bio-luminescence and flash patterns as well as how to help save them. 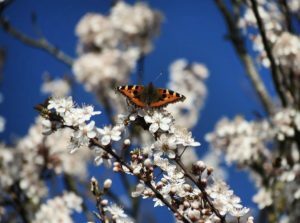 The National Butterfly Center in Texas may be a thing of the past if the United States follows through with its plan to build a border wall. Why should we care? Scientists and volunteers recently discovered that monarch butterflies need nectar and warm air currents for migratory survival. Scientists, volunteers and prisoners team up to create sustainable flight paths.